A Chief from the Capote band of Utes is singing his horse stealing song. Dressed in full regalia, he is relating stories at a gathering. 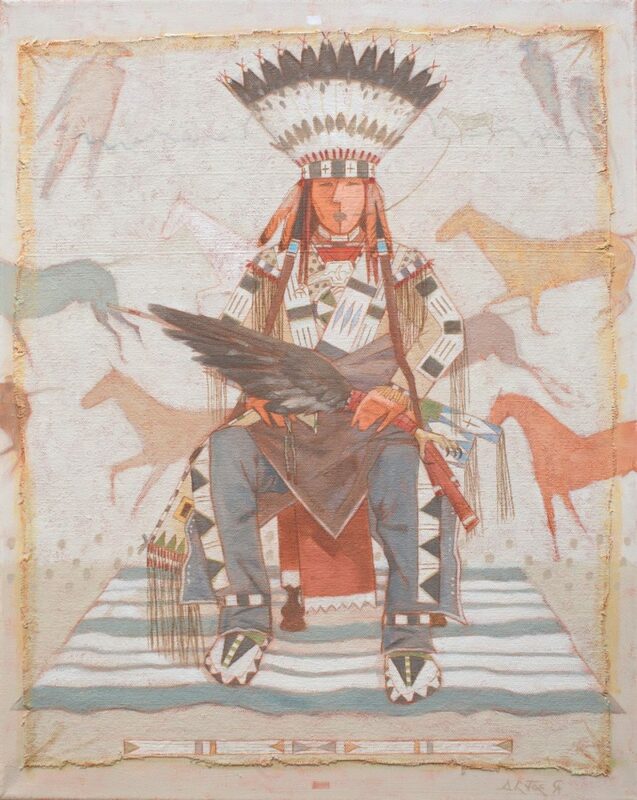 He sits on a modern day wooden chair with a first phase navajo rug on the earth floor. The upper right hand corner are two faint representaives of two hawks. On the left corner an eagle is painted. It is said that the eagle and hawk are relatives. So, the warrior draws his medicine power from the birds. The Chief is wearing a variety of ornaments along with his buckskin shirt and trade cloth leggings. Among them a silver gorget on his chest and long beaver skin braid ties. Another prize possession is a left eagle wing with and the claw attached. He holds a pipe bag with his left hand signifying the that he is now a Holy man practicing a ceremonial life.